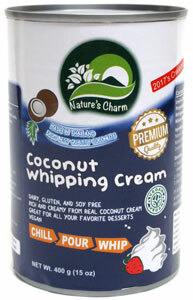 There's no easier way to make your own delicious coconut cream whipped topping than with Nature's Charm's new Coconut Whipping Cream! Free of dairy, gluten and soy, it's also free of palm oil and trans fats, giving you a healthy and delicious way to top off your favorite desserts and foods. All you need to do is chill the can, pour the contents into a bowl and whip until fluffy for plenty of sweet vegan topping that'll tantalize your tastebuds. Spoon some on your favorite vegan ice cream, top off your cakes or brownies, or, put in a bowl with fresh berries for a delicious treat at breakfast or any time of day. 15 oz. (400g) can is $4.69.